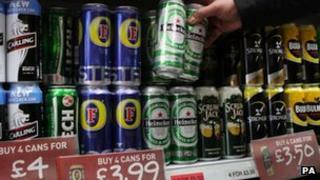 The government has shelved plans to introduce a minimum price for a unit of alcohol in England and Wales. Minister Jeremy Browne said the policy would remain "under consideration" but there were fears the change would hit responsible drinkers. A ban on multi-buy promotions has been rejected but sales will not be allowed below the cost of alcohol duty and VAT. Labour said the government had done a U-turn on a flagship policy that both the PM and home secretary had backed. Mr Browne said problem drinking turned towns and cities into effective "no-go areas" for many people, was seen as instrumental in many violent attacks and cost the taxpayer £21bn a year in crime and health issues. But he said there was not enough "concrete evidence" minimum pricing could reduce the harmful effects of problem drinking without hurting those who drank responsibly. "We are not in the business of making laws that do not work. We consulted on it and we heard what people say," he said, pointing out that 34% of those who responded backed a 45p minimum unit price but 56% had disagreed. Multi-buy promotions in shops, such as two-for-one deals, will also not be banned as, Mr Browne said, there was not enough evidence it would have a big impact on how much people were drinking "at a time when responsible families are trying hard to balance their household budgets". As part of a wider strategy to deal with heavy drinking, he said there would be tougher action on "irresponsible promotions" in pubs and clubs and the alcohol industry would need to do more to educate people about safer drinking and on responsible marketing and product placement. If it was the right thing to do then, why isn't it the right thing to do now? And Mr Browne said banning sales of alcohol below the cost of duty and VAT would mean a can of lager could not be sold for less than about 40p from spring 2014. However, Conservative MP Sarah Wollaston, a GP, said that would have an "absolutely meaningless impact" and doctors would see the decision not to introduce a minimum price as removing the one tool that could help them reduce avoidable liver disease deaths. For Labour, shadow minister Diana Johnson accused the government of "performing a U-turn on their flagship policy". She said the consultation had never been about whether or not to introduce minimum unit pricing - it was about what level it should be set at. She quoted David Cameron, who had said the policy would not be "universally popular" but being in government wasn't "always about doing the popular thing". Ms Johnson said: "If it was the right thing to do then, why isn't it the right thing to do now?" She said Labour had felt there were some issues that had to be addressed - particularly its compatibility with EU law and concerns it might result in a "windfall for supermarkets". But she said the party had offered to work with ministers to overcome these obstacles. She said research suggested a ban on the sale of alcohol below cost would raise the price of less than 1% of alcohol sold in shops. Labour has suggested the government's decision to shelve plans for plain cigarette packaging can be linked to their election strategist Lynton Crosby - something denied by David Cameron. But Ms Johnson said: "Of course, now, Lynton Crosby has ordered a U-turn ... and minimum pricing along with most of the rest of the alcohol strategy as well as other important public health measures have been scrapped." However Mr Cameron said on Wednesday the decision had been made "by me as prime minister, consulting my cabinet colleagues" - citing concerns over evidence it would work and possible legal challenges. He said the idea "has merit" and could be returned to in future, once there was more evidence and more certainty about potential legal challenges. MSPs passed legislation to bring in minimum pricing in Scotland last year, setting a 50p unit price but the law will not be implemented until legal proceedings, brought by the Scottish Whisky Association, are complete. Northern Ireland is yet to put forward a specific proposal, although it is reviewing pricing. The Salvation Army said it was disappointed at the decision. Spokesman Gareth Wallace said: "By reneging on its commitment, the government is turning its back on the most vulnerable people in society. " Prof Sir Ian Gilmore, chairman of the Alcohol Health Alliance UK, said the government had "caved in to lobbying from big business and reneged on its commitment to tackle alcohol sold at pocket-money prices". But the decision was welcomed by the Wine and Spirits Trade Association, whose chief executive, Miles Beale, said: "We remain opposed to minimum unit pricing. "We agree that there is insufficient evidence to support the introduction of minimum unit pricing. "It would unfairly penalise the majority of responsible consumers while doing little to tackle the root causes of alcohol misuse."